The bigger the better to allow for maximum growth of your turtle so about a 4ft to 6ft tanks is recommended. Under gravel filters are most efficient. Provide a bigger surface area for bacterial breakdown of nitrogenous wastes, 2 – 3 inches of gravel is needed for filters to work efficiently creating an ecologically viable way of keeping the tank clean leaving you with only needing to clean gravel with a siphon/vacuum 3 – 4 times a year. Yes it is that easy. The preferred optimal temperature zone for turtles is 28 – 30 degrees. In the wild, the turtles bask on logs and rocks in the sunshine to maintain their POTZ in captivity so there is no need for basking, or “haul-out” areas if the water temperature is maintained at 28 – 30 degrees. The temperature should be maintained with a thermostatically controlled heater and checked with a digital probe thermometer at both ends of the tank. If the tank is not heated appropriately, the turtle cannot function effectively and their immune systems are weakened and become susceptible to secondary infections or even stop eating. Turtles need to be fed a balanced diet with adequate supplies of vitamins and minerals. Wombaroo reptile supplement provides the necessary vitamin and mineral requirements. The basis of your turtle diet should be a Wombaroo/meat mix. We recommend Beef heart as its a good quality lean meat. Meats to stay away from are Human grade commercial mince as it is too fatty for turtles. Buy a beef heart, trim off any excess fat and mince it in a hand mincer, mix 2 cups of minced beef heart to 1 cup of Wombaroo reptile supplement. (Two thirds minced heart to one third wombaroo mix) Roll the finished mix into a “sausages” and put into sandwich bags and freeze. The frozen “sausages” can be cut with garden seceters and should be used within 6 months. To maintain a balanced diet, turtles should be fed “whole” food items eg; Feeder fish, crayfish and prawns. Whole food items provide calcium and vitamins in the form of bones, exoskeleton, organs and abdomen contents. Never place all of the live food in the turtle enclosure at the same time as the animal will gorge itself and have a great time. Keep live food in a separate aerated container and feed the wombaroo meat mix to provide healthy prey for your turtle. Turtles should be fed a meal equivalent to the size of their head. Young, growing turtles should be fed daily – as they begin to reach half-grown to full size – they can be cut back to feeding every second to third day. In the first and second years, they should grow from 50cent piece size to palm size – in the second to third year they should grow from palm size to hand span size – in the third to fourth year they should be reaching full “dinner-plate” size. As they reach “hand-span” size feed them every second to third day – keep regular records of your turtle’s growth – each month record the weight and head to tail shell length – if the turtle is increasing in weight but not increasing in length, it will be getting fat – you need to cut back on feeding. 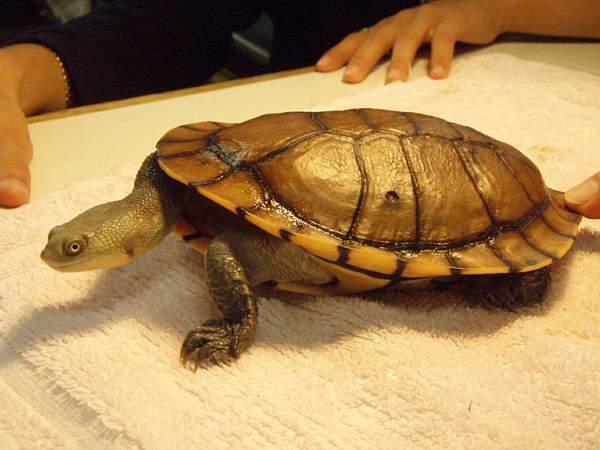 If it neither the weight or shell length is increasing, the turtle is stunted and needs to be fed more. Once the turtle reaches its full size the weight should remain stable – a healthy turtle’s “armpits” should never be fatty or puffy.